I have just taken part in a Movie Survey, just a few simple questions about movies. Click Here to take part, it only takes a couple of minutes. Amongst the questions you get the chance to name your favourite film of the year as well as give an option on the biggest/most overrated movie of recent years and some classic directors. The final part of Stieg Larsson’s “Millennium Trilogy”, following on directly from The Girl Who Played With Fire. Computer hacker extraordinaire Lisbeth Salander (Noomi Rapace) is recovering in hospital after being shot in the head by her farther, who is in a neighbouring room recovering from wounds inflicted by Salander. Her half-brother (who would make a good henchmen for a Bond villain) Ronald Niedermann (Micke Spreitz) is on the run and out for revenge, to top it all off she is awaiting trial for the attempted murder of said farther. 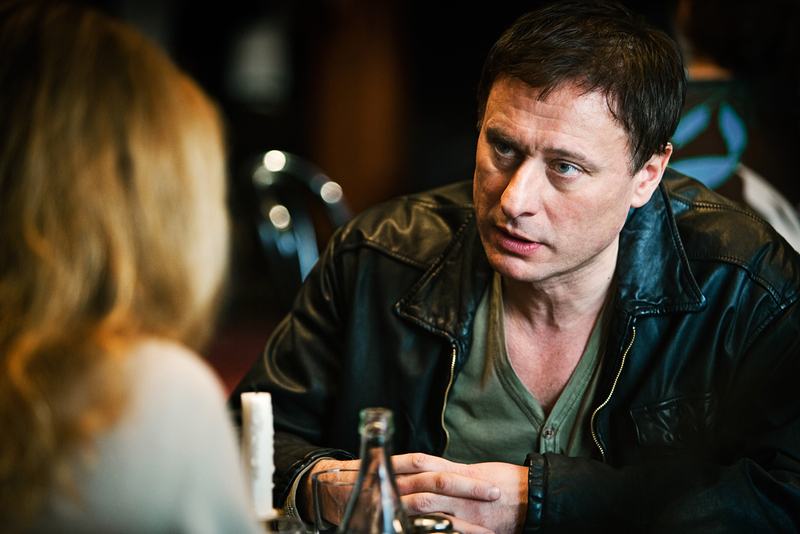 Journalist Mikael Blomkvist (Michael Nyqvist) sets to work proving her innocence and exposing a conspiracy that goes back to before Salander was born and responsible for her mistreatment from childhood. The biggest problem with the second movie in the series The Girl Who Played With Fire is the way the two protagonists are isolated from each other for the vast majority of the running time. This final movie has the same problem but gets away with it more than the second film as it has a better story. The most interesting thing about the trilogy is how far the movie has come from the first instalment, The Girl with the Dragon Tattoo. That first film was a murder mystery this one a full blown conspiracy thriller, the second works best as a setup/bridge to this final part. It will be interesting to watch all three films together to see how they work together. One think that is clear, like Star Wars the first movie is the only one that works as a standalone story. As with the other movies in the series the story is hugely simplified from the books. Interestingly this movie looses more of its subplots but does give its peripheral characters more to do. Lisbeth Salander is the heart and soul of the story in the books, it isn’t always easy to translate this to a movie, the issue is solved by the perfect casting of Noomi Rapace. Her performance makes the emotionally isolated and insular character both interesting and compelling. With all the rich supporting characters reduced to simplified caricatures it emphasises Salander’s character. Considering this it is no great surprise that the movies best moments come when it follows the story set out in Stieg Larsson’s novel, the best of these come in the courtroom scenes, not jus Salander’s appearance but her attitude and perfectly delivered dialogue. But how good is it? To put it simply better then the second movie but not as good as the first (just like the books). 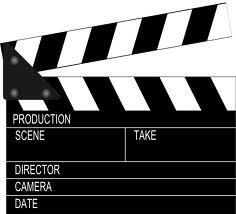 If you have seen the first two movies you will probably see this too, if you haven’t seen the first two not only will it make little sense to you but it will be of little interest to you. A note on the upcoming remake of The Girl With The Dragon Tattoo. I am not completely convinced by it for three reasons: as a concept it is flawed, if they want to make an English language version with British and American actors they should have transposed the story to Britain or America. Secondly and more importantly, the original movie was so good I’m not sure a remake will live up to it. Finally the casting of the Swedish version was perfect how will the new cast particularly Rooney Mara work? The flipside to this is that David Fincher is one of my favourite directors and if anyone can do it, it is him giving the movie a dark tone and bringing action and suspense to the most mundane scenes. I would also like to see if he can make more of the flawed second and third movies. Rooney Mara and Daniel Craig over to you. 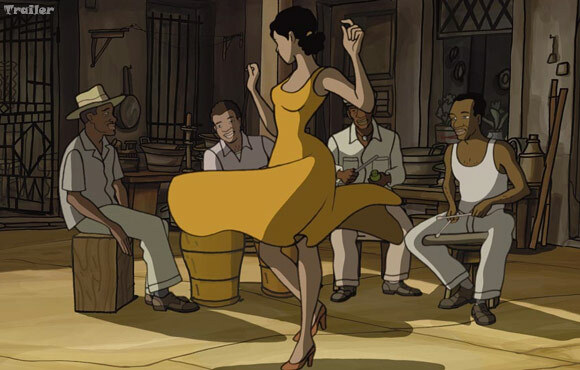 Cuba 1948, pianist Chico (Eman Xor Oña) is intrigued and infatuated by beautiful singer Rita (Limara Meneses). Initially dismissive, she soon warms to him, in no small part because of his musical talents. But the course of true love doesn’t run smooth, as the story moves to New York and then Las Vegas there is always something preventing them from being together. I have never made a secret of the fact that I am not much of a fan of animation. I have always felt that most stories can be better told by real actors in real locations but there is something magical about the images of this movie that look like a moving version of the pages of a graphic novel. The story is overly simple and its portrayal of time is crude and week but all this isn’t really important this is a story about love, romance and music. As fate and other people conspire against the couple you can’t help but want them to find happiness together. The best thing about it, the music, the original score by Bebo Valdés is sensational making the movie essential viewing for any jazz fan. Not the most original story but a beautifully told and compelling one. As a huge fan of Hammer I couldn’t let the passing of Ingrid Pitt go by without a mention. Ingrid Pitt was born Ingoushka Petrov in Poland in 1937 to a German father and a Polish Jewish mother, they spent part of the second world war in a Nazi concentration camp. After the war she met and married an American soldier and moved to California. After the breakdown of her marriage she returned to Europe before but was back in America before long perusing a career as an actress in Hollywood. Working as a waitress to support herself she appeared in supporting (often unaccredited) roles before receiving her big break in the Clint Eastwood/Richard Burton movie Where Eagles Dare (1968). Her next movie was The Vampire Lovers (1970) and thus started her most iconic image as the queen of Hammer horror movies. She also appeared in the classic British horror The Wicker Man (1973) and the brilliant BBC adaptation of John le Carré’s Smiley’s People (1982). Check out The Telegraph for a full obituary. I have just been to see The Girl Who Kicked the Hornet’s Nest, review to follow in a few days when I have time to write it. 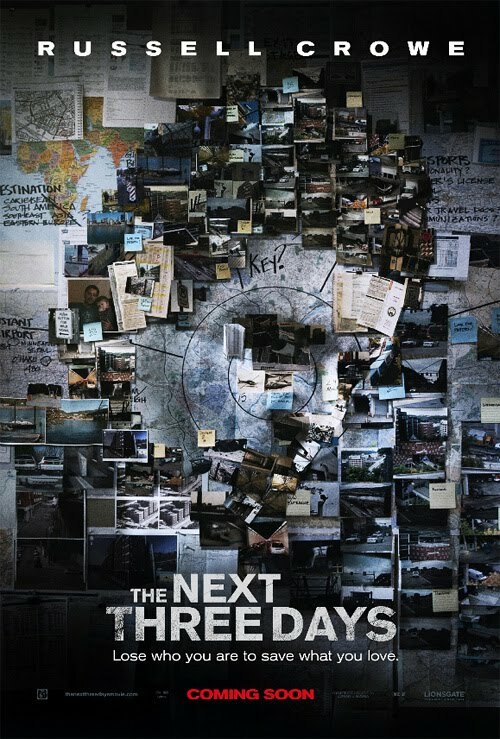 Before the movie I saw the trailer for the new Russell Crowe movie The Next Three Days. It seemed like a good time to remind people of the original French version Pour Elle (Anything for Her) from 2007. Warning the final paragraph contains a spoiler. Lisa (Diane Kruger) and Julien (Vincent Lindon) are a normal happily married couple with a young son. Julien is a teacher and has a difficult relationship with his farther and Lisa doesn’t get on with her boss, all normal occurrences for a normal couple in the real world. Then one day their life is shattered when Lisa is arrested for a violent murder. Sentenced to twenty years they appeal against the conviction but when it fails after three years and no legal avenue is left open to them Julien takes matters into his own hands. As an ordinary person with no criminal background he does not know where to start. The bulk of the film is made up of him slowly and carefully planning. First he interviews a man who has written a book about escaping from prison. Then he sets about getting fake passports (surprisingly easily) then he plots the breakout and where to go after that. All this whist trying to live a normal family life raising the couples young son Oscar (Lancelot Roch) and continuing in his teaching job. A confidently directed first feature by Fred Cavayé the film unfolds slowly until the last third where the pace picks up as Julian makes the final preparations for the breakout. With over the top prison breaks such as on the television show Prison Break this film is refreshingly simple and believable mainly because of the setting of ordinary people put into a difficult situation reminiscent of the film Tell No One (coincidently directed by Diane Kruger‘s ex-husband Guilaume Canet). As you would expect Julian makes mistakes along the way, this adds to the believability and the emotional involvement with the characters. The settings and photography are suitably dull grey and downbeat giving a slightly oppressed feeling to the film that is lifted by great acting from the leading couple. A flashback clearly establishes Lisa’s innocence or guilt, this is a shame as some ambiguity could have added an extra element to the plot but that is a minor criticism. One final thing to point out the film is French and is shown with subtitles; I hope that doesn’t put people of seeing this interesting little film. I recently saw the 25th Anniversary re-issue of Back To the Future at the cinema. I intended to review it at the time but have been really snowed under lately so haven’t got around to it. Not wanting to let the moment pass without mention I have gone for a lazy post. A reprint of my top five 80’s time travel movies. For a list that has more effort put into it check out ﻿﻿“The List”﻿﻿, I am particularly happy to see the inclusion of three underappreciated recent movies, Timecrimes, Primer and Triangle. 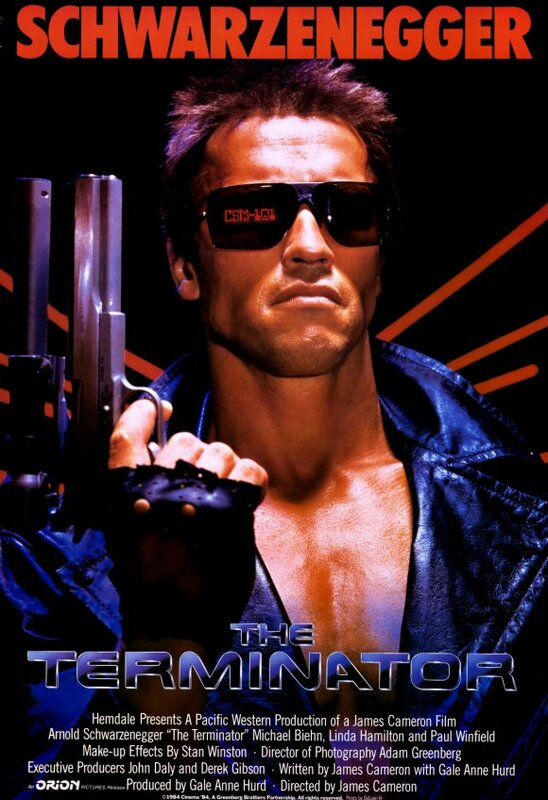 The Terminator (1984): The Terminator skilfully blends genres, as well as the time travel it is a great action thriller, it has elements of a war movie, it is great science fiction and probably the most mainstream cyberpunk movie ever. It is also the most significant movie of Arnold Schwarzenegger’s career. The biggest problem with making time travel in a movie is justifying its existence, if time travel were possible why haven’t we heard about it before? In terminator that is easily brushed aside but the paradox of time travel isn’t, it lingers on after the movie has finished. 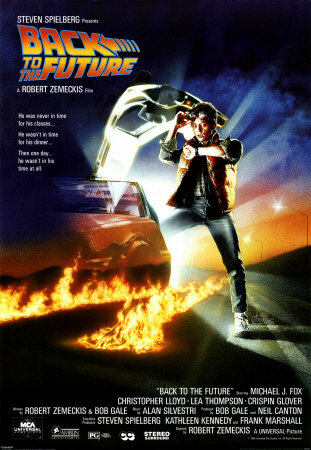 Back To the Future (1985): Looking back twenty-five years (that makes me feel old) tells us what a great movie Back to the Future was. The clever script by Robert Zemeckis & Bob Gale is just brilliant, the paradox of time travel is as well captured as in Terminator and dialogue is funnier than Bill and Teds Excellent Adventure. Everything is held together by a charismatic central performance from Michael J Fox. And one final note on the movie if you are going to make a time machine in the 80’s is there anything more iconic you could have made it out of than a DeLorean? Trancers (1985): Evil criminal Whistler uses his powerful hypnotic ability to transform the week minded into zombie like drones (trancers) to do his bidding. Avoiding capture he travels back in time from 2247 to 1985 inhabiting the body of one of his ancestors. He is closely followed by hardboiled detective Jack Deth (Tim Thomerson). Its cheep cheery fun that doesn’t have the budget or production values of Back to The Future but that really doesn’t matter. Also look out for a young Helen Hunt as the love interest. 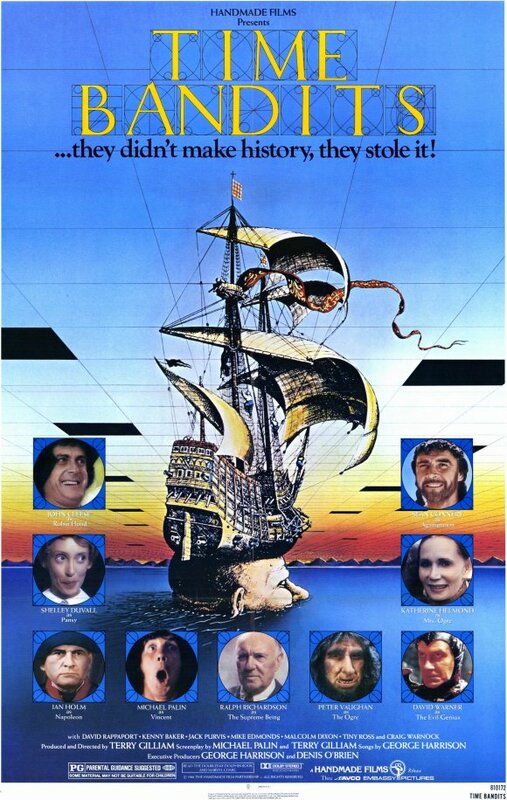 Time Bandits (1981): Director Terry Gilliam first foray into time travel. A young boy travels through a “time hole” in his bedroom and is taken on adventure with a group of dwarves who travel through time looking for treasure to steal. The movie boasts an excellent cast that includes former Pythons a future Hobbit and a former James Bond. The overall result is a bit of a mixed bag but the visual style set the tone for the director’s future work and has been very influential. 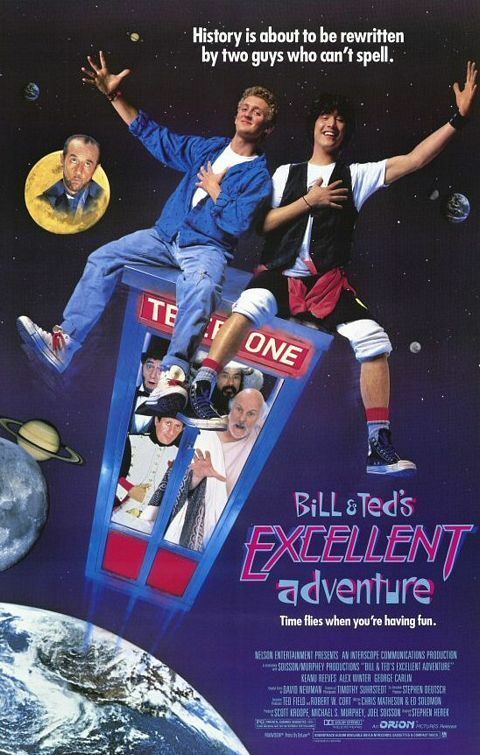 Bill & Ted’s Excellent Adventure (1989): Before he learnt surf, before he discovered he was The One and before he found a bomb on a bus Keanu Reeves was Ted Logan, along with his buddy Bill S. Preston, Esq. (former Lost Boy Alex Winter) he travelled the through time and space to avoid failing his history exam and save the future in the process. The whole “Party on, dudes!” thing has been done to death so the movie feels tired now but is still worth a look if you haven’t seen it. Peter Highman (Robert Downey Jr) is all set to fly home from a business trip to his pregnant wife, Sarah (Michelle Monaghan) until an encounter with aspiring actor Ethan Tremblay (Zach Galifianakis) wrecks his plans. The pair are ejected from the plane and placed on the No Fly List, thus begins a race against time to get home before Sarah’s scheduled Caesarean section. What follows is a series of ridiculously contrived events that complicate their journey. Comparisons between this and the John Hughes classic Planes, Trains And Automobiles are inevitable but lets get one thing straight to begin with, Due Date isn’t in the same league. We are left with the other comparison; the movie shares a star and director (Zach Galifianakis and Todd Phillips respectively ) with The Hangover. Sadly it doesn’t really match up to The Hangover either as it just doesn’t have as many genuinely funny moments. The biggest problem is neither of the characters are particularly likeable, furthermore, the re-teaming of Downey Jr. and Monaghan (who were brilliant together in Kiss Kiss Bang Bang) never really happens as Monaghan is reduced to a forgettable supporting role. The best road movies tend to have an existential theme running through them or at a subtext that can give more meaning or gravity. Without that the movie has to rely on its comedy to get it through but it just isn’t funny. Even the idea of Peter’s journey towards redemption is kind of lost. Along the way there are some interesting cameos. These include RZA as a belligerent Airport security officer and Juliette Lewis as a dope dealer. The most bizarre of them is Jamie Foxx as an old friend of Peter’s, initially his appearance appears to be a misstep or at least strange interlude but it does serve to bring out the nasty side of Peter’s character. If movies were people this would be The Hangovers less funny, less charismatic cousin doing a half-hearted impersonation of Planes, Trains And Automobiles.